This is the article I kinda had in mind when I set about writing my Lola profile (albeit in French instead of English). Martin Birrane, who took over the Lola concern from Eric Broadley in 1997, has died. RIP. dr-baker wrote: This is the article I kinda had in mind when I set about writing my Lola profile (albeit in French instead of English). I actually studied French at university level so I can read both French and English fairly well. Thank you for writing your article, it was good. And I still intend on fixing the links in the first post at some point, honest! EDIT: I have just noticed that all the image links in the first post are actually all working, so no need to fix them.. 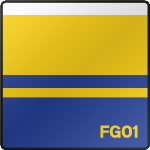 Looking at qualifying for the Australian Grand Prix, all of the Bridgestone-shod cars qualified considerably slower than the Goodyear cars. 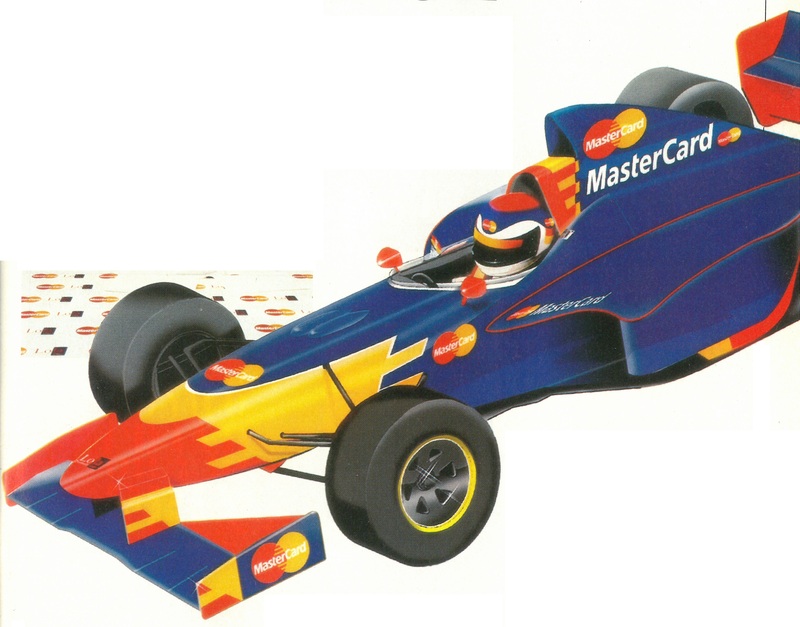 Only two Bridgestone cars qualified in the top 10 (Johnny Herbert and Olivier Panis), with the back half of the field almost completely made of Bridgestone users. 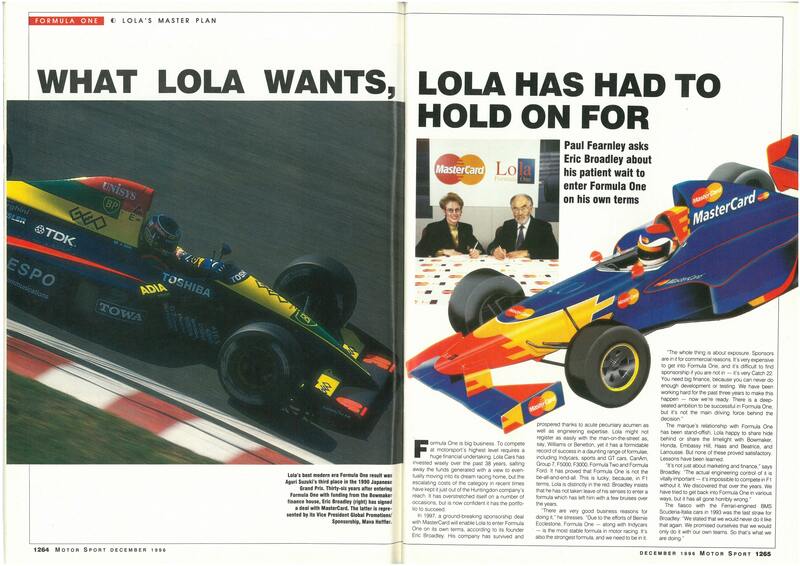 The Lolas also uses Bridgestones, but in the following grand prix in Brazil (the race where Lola already closed its F1 operation) Bridgestone addressed issues with its tires if Panis's 5th place and Hill's 10th were any indication. This makes me wonder: Would the Lolas of qualified for the Brazilian GP if they kept going after race one? 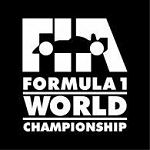 If the tire issues were a deciding factor it makes the move to scuttle the F1 team as premature. 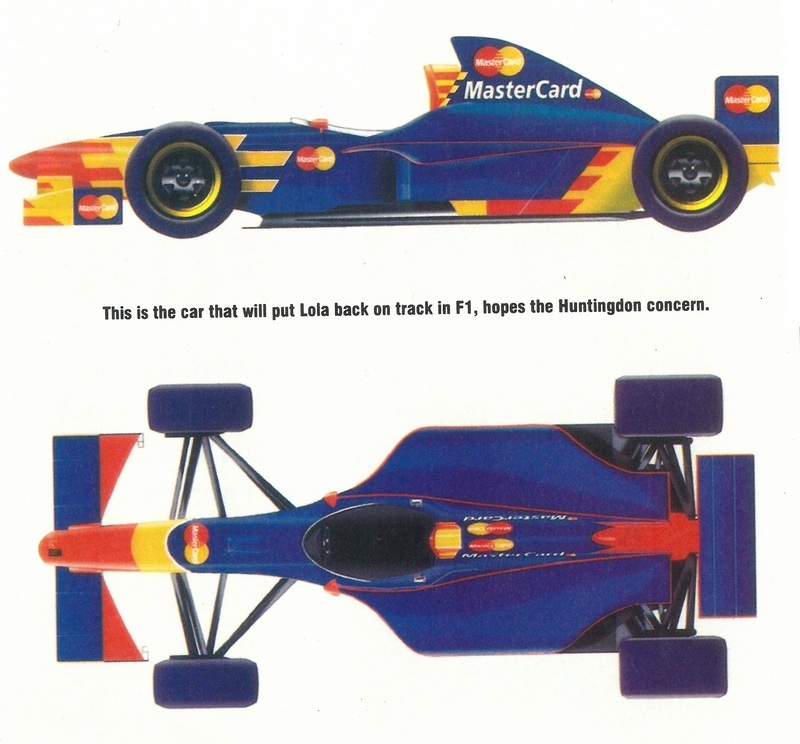 They probably still would of made the back row of the grid, but at least the car would be racing. Is there any credence to this theory? 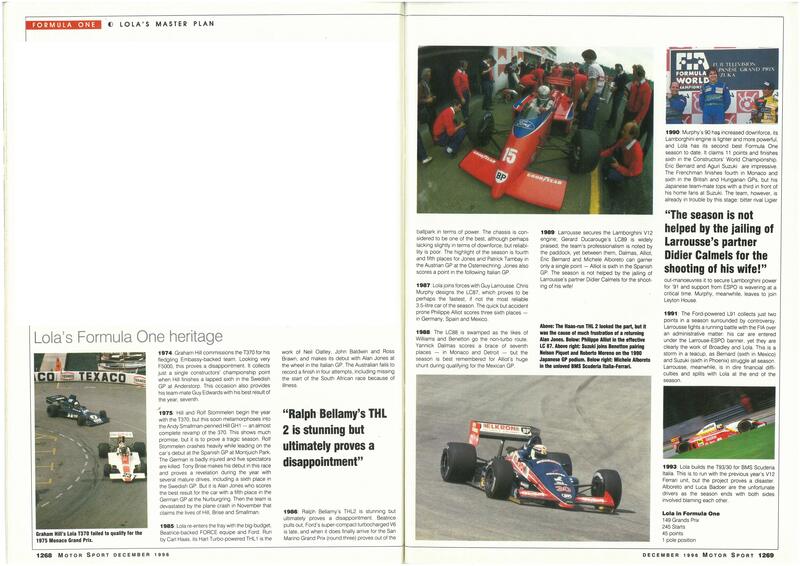 Not yet in Brazil, At Australia, the gap between Lola and arrows who were second last, was just too big. 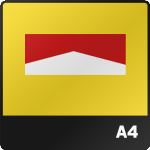 But maybe from the European season on they could be doing better in the Bridgestone-favoured tracks. But they would have needed a reliable sponsor to get that far. Let alone do some development on the car. Another problem was the sub-par driver quality. Come on, I don't think Vincenzo Sospiri was that bad. I'm not sure Sospiri was bad, but he defenitely lacked the experience to set-up the car. Coupled that to Rosset being Rosset. Michael Schumacher wrote: The only heroes I really had were in the karting days, seeing two guys one of which was Ayrton Senna and the other Vincenzo Sospiri. They were so special in their own way, dominating the karting world. It was just fascinating to watch them. How was Ricardo Rosset able to go four WHOLE seconds quicker in this Bridgestone test than in qualifying at a race meeting? Was he making repeated mistakes in qually? Were the weather conditions different? Was the track more rubbered in? Was he in a different, better chassis? Was the engine mapping different? Were the tyres just that much better? 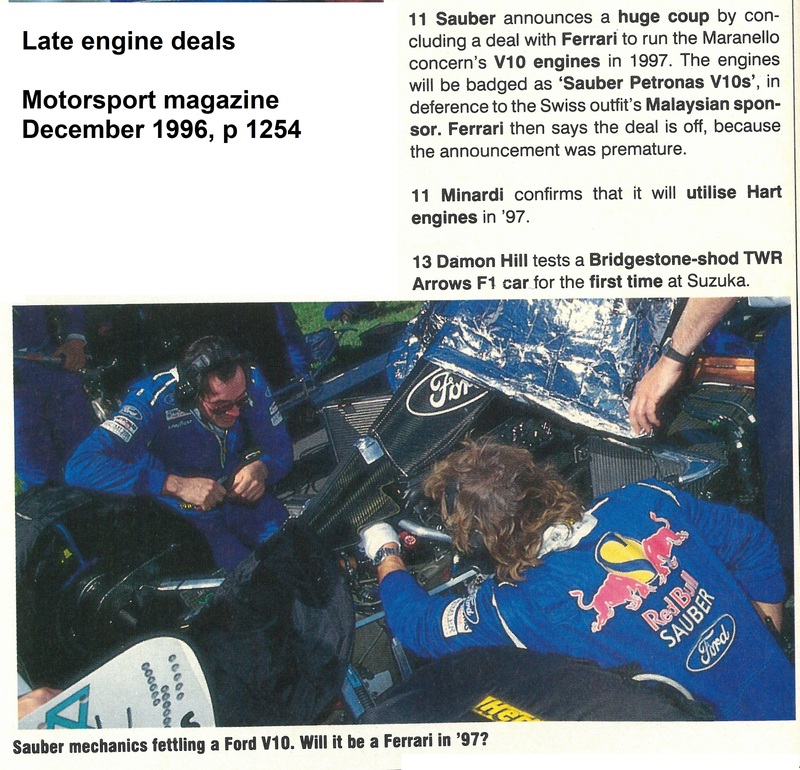 Some other teams announce their engine deals at a late date (11th November 1996). 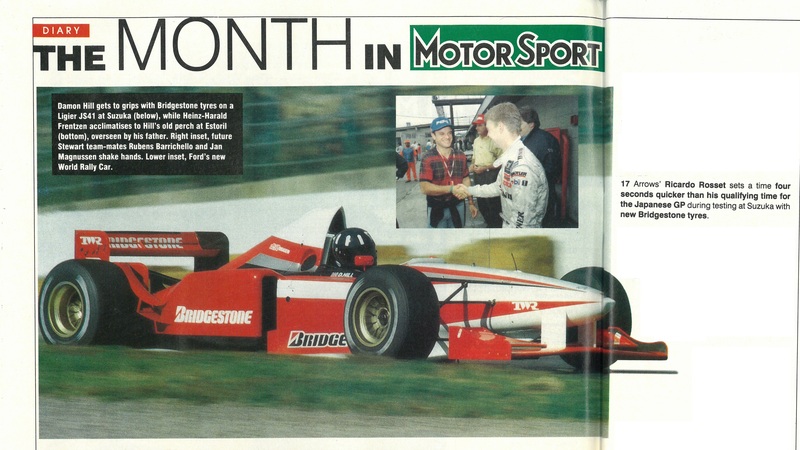 I cannot remember if it was normal practice then to announce engine deals for the following season so late? Was it to avoid promoting a different engine brand while continuing with their current engine partner during the contemporary season? 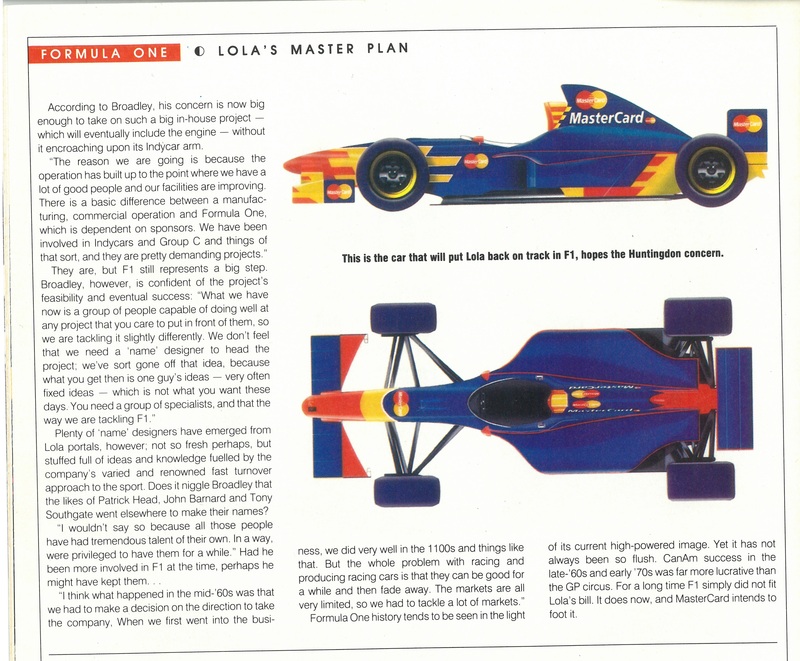 This (below) is a useful chronological timeline of Lola's history in Formula 1 in the run-up to their works entry. 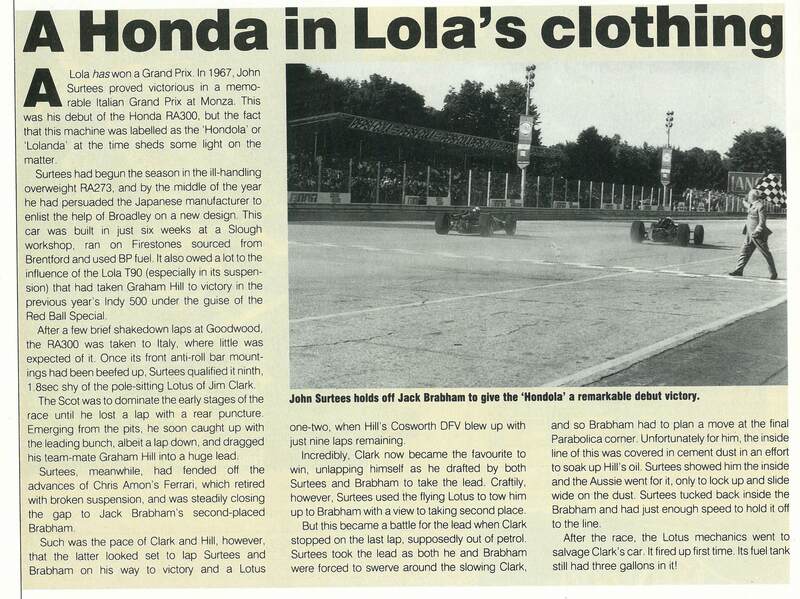 It seems odd now, looking back at the works entry that carries Lola's name, that Lola actually has a race win under another entry's name! 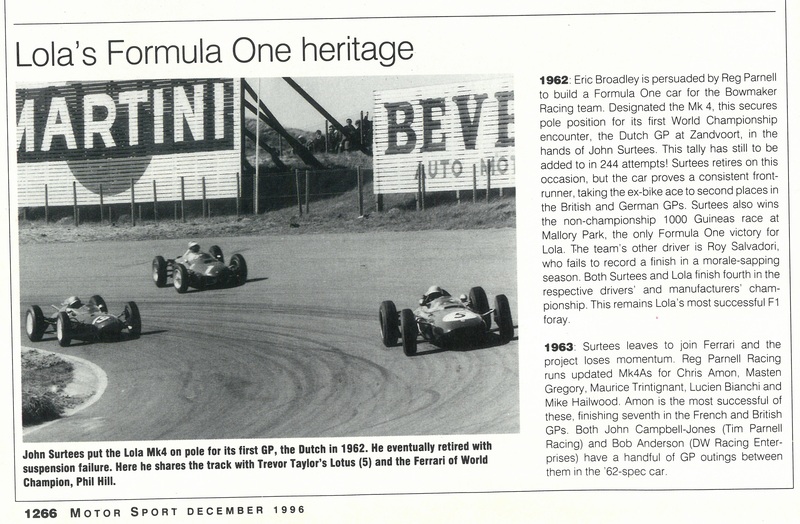 Some interesting info about the testing of the Lola T95/30. I will add this to the first post in due course. They really have no ideas do they? It is the team formerly known as Spyker, formerly known as, Midland, formerly known as Jordan after all, so maybe revive the Jordan name? I wouldn't oppose that!